When you think of recruiting, you’re likely reminded of a series of mundane tasks that must be completed to make a successful hire. Well, that process is unfortunately dated, and is why so many of our clients find themselves stuck when identifying, retaining and developing new hires. 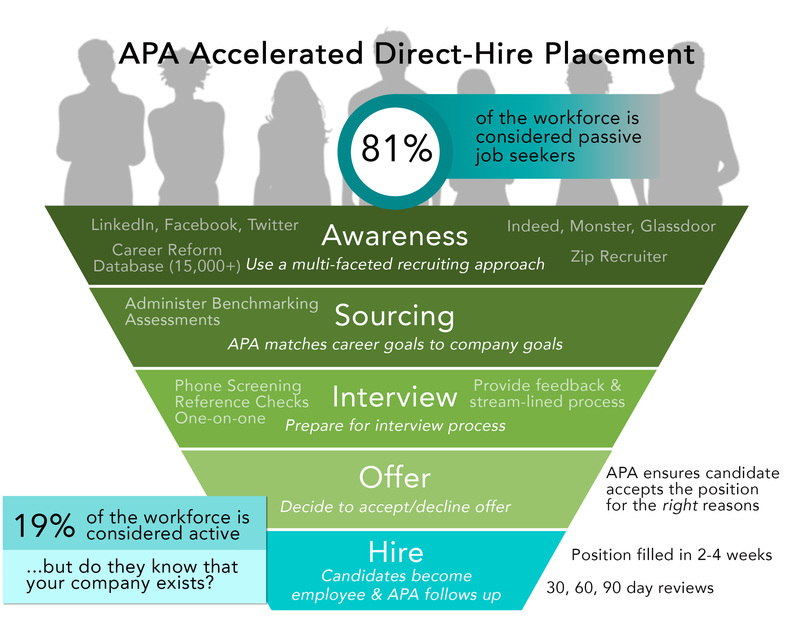 Looking to improve recruiting efficiency? If you love to keep learning, want to truly make an impact on your company and progress in your career, it’s time for you to become the expert. As coaches, we know how important professional and organizational development is. We see it as a truly ongoing, systematic process of implementing effective change, and want to share our best practice tips with your team. This program is inclusive of all leaders, recruiters and hiring managers who are seeking innovative science-driven techniques for attracting, securing, retaining and coaching top talent. Our certified consultants will teach you the best tactics on how to align your hiring initiatives to your business strategies. Having trouble deciphering talent assessments? The DISC behavioral assessment and Workforce Motivators and Driving Forces have become valuable instruments in the hiring process. However, too often a company administers the assessment, but isn’t sure how to execute on this powerful information moving forward. What if there was a designated in-house professionals that had the training necessary to implement this brain-based data? Send a member of your team to become certified in the administering and deciphering process of these great assessments. After robust training sessions on Behaviors, Motivators and Emotional Quotient, our in-house certified TTI experts will guide you through the process of analyzing profiles, trouble-shooting solutions and perfecting management styles. Being fully certified gives you a complete understanding of each behavior, enabling you to become a better coach for your team. In addition, this will help you learn the theories quickly, gain confidence in yourself, and add to your professional tool box while utilizing this knowledge in the most effective manner possible. Placing a candidate taking longer than expected? After 30+ years of monitoring the way the job seeker thinks and feels, our certified consultants come prepared to take the guess work out of your selection process. Opinions are wonderful when it comes to the color of a new car, however, they become irrelevant when it comes to identifying the perfect candidate. Isn’t it time to move past gut feelings when hiring talent for your company? Your pocketbook will absolutely thank you once we reduce your recruiting budget and turnover, while increasing retention. As your strategic partner, we help create or revise your job description and candidate profile utilizing advanced job benchmarking techniques. We include scientific assessments that allow the position to become a living and breathing entity, allowing for a 98% match rate. Utilizing many sourcing avenues, our classic contained search will provide only the perfect candidate options for your specific position. All you have to do is sit back and enjoy the fact that you just made a great investment in your people process. Is that potential hire a good fit? Do you ever worry: “Am I making the best hiring decision for my company?” or, “What am I really getting with this candidate?” Well, our DISC assessment gives you the well deserved piece of mind by providing insight into your candidates behaviors, motivators and key competencies to confirm that you are making the right decision. It’s like getting an owner’s manual for all levels of your perspective employees. Our brain-based talent specialist will conduct a comprehensive candidate audit to ensure that your potential employee is aligned with the role and organizational culture. We utilize talent assessments such as the DISC from Target Training International in conjunction with our knowledge of behaviors and motivators to aid in the selection process. This option is a must have for companies looking to remove the guess work out of their hiring process. Costs are too high for gut feelings. Let the data talk!